and we wish you all the best for the new year. introduce you to the 5 most important characteristics of pilot caps. welcome you to our Olino team in 3 employee spotlights. share a few highlights of 2016 and some expectations for 2017. We see a clear picture! Airline hats are making a comeback after some years of decline. The cabin crew hats and the pilot caps are playing a more prominent role in creating a professional look for your airline crews. Generally, pilot caps vary on a few characteristics. We would like to share with you the 5 most important characteristics to consider, when you’re shopping for new pilot caps for the flight deck crew. The cap style range from a distinct military style with bigger top and stiffer appearance to a less distinct cap style with a smaller and softer top. The trim of the cap includes the chin strap, the badge, embroidered leaves and any additional decoration and ornaments. The trim is typically made in contrasting color or material. Often gold is the color but silver, matt silver or any combinations may fit the overall color scheme better. Most often the color of the top matches the uniform garments, eg. navy or black, and it may even by made of the same kind of fabric. Practical concerns such as water resistance or color fastness may lead to more specialized fabrics. The two most common front elements are the badge and the wing. The design of these elements usually includes the logo or name of the airline and stylized wings. It is a choice of 2 different materials: embroidery or metal. Generally, Captains wear caps with embroidered leaves on the vizor and First Officers do not wear leaves. The leaves typically resemble oak leaves or olive branches. Do you want to know more about pilot caps and cabin crew hats? In this very first blog post of 2017 we introduce 3 new and dedicated Olino employees who joined us in 2016. Please give them a warm welcome. Completely new and redesigned, mobile friendly website. 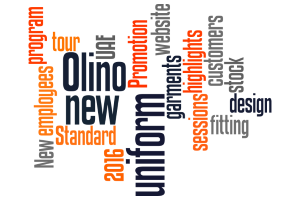 New Olino Standard stock program with updated uniform garments in navy, black and charcoal. Promotion tour targeting aviation in the UAE arranged by the Royal Danish Consulate and headed by the now former Minister of Business and Growth Mr. Troels Lund Poulsen. Fitting sessions in Norway with our new customer the Airport Express Train in Oslo and their more than 300 train hosts, train drivers and customer service staff to be dressed in new uniform garments. Uniform design projects for customers and prospects, including Turkish Airlines, Jazeera Airways and Emirates Airways. Another busy year with new and existing customers assuring your professional uniform garments on time. Launch of new uniforms at the Airport Express Train in Oslo. Developing a new uniform program for Jazeera Airways in Kuwait. Opening a B2B web shop with our Olino Standard stock program. Upgrading of our internal IT systems as part of a larger project of digitalizing our business processes. If you have any questions about our uniform solutions, products and services, don't hesitate to email or call us. Visit our webshop for Corporate Wear customers. Please login with your Olino account name and password.